Heat oven to 375°F. In medium bowl, mix Crumb Topping ingredients with fork until large clumps form. Refrigerate. Spoon icing from can of rolls into small microwavable bowl; cover and refrigerate. Lightly flour rolling pin and work surface or cutting board. Separate dough into 8 rolls. With rolling pin, roll each cinnamon roll, cinnamon side up, into 4- to 5-inch round. In ungreased 9-inch glass pie plate, place 1 dough round in center. Arrange remaining 7 dough rounds around center round and up side of plate, overlapping slightly as necessary. With fingers, press dough to seal together in bottom and up side of pie plate to form crust. Flute edge. In large bowl, gently mix Filling ingredients. 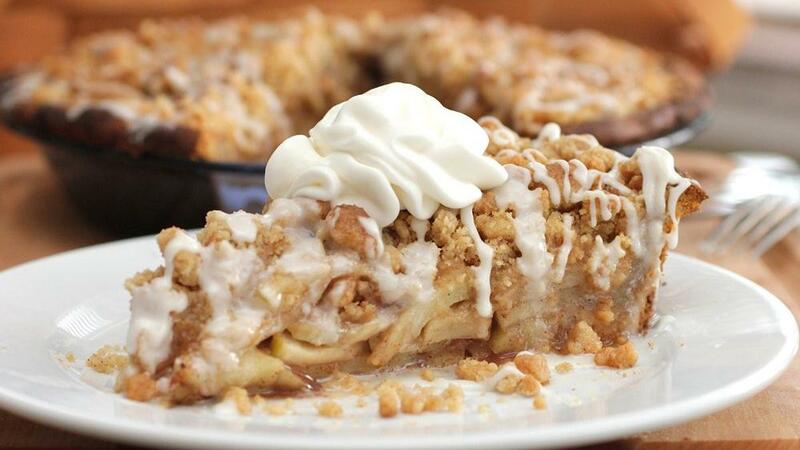 Spoon filling into cinnamon roll-lined pie plate. Sprinkle crumb topping over top to completely cover filling. Bake about 1 hour or until top is golden brown and apples are tender. Cool on cooling rack at least 1 hour. Before serving, microwave icing on High 10 to 15 seconds or until runny enough to drizzle. Drizzle back and forth over top of pie.